Social networking got its own map and it looks great..
Click on the image above to get it up to its full size. We’ve stuck a couple of our favourite cut-out sections in a gallery below. 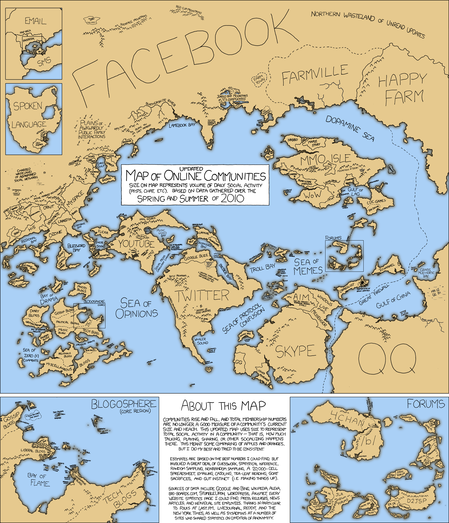 Look out for the Twitter continent, the Facebook landmass, the Sea of Opinions and the core region of the Blogosphere. The artist – a genius on xkcd – said (s)he tried to reflect overall activity on the networks rather than just the number of members. Research did go into the making of this piece of art, so don’t just read the jokes. It is xkcd after all, so I think we can expect there is a serious number-crunching behind this all..
Facebook Groups: is it all getting too complicated?